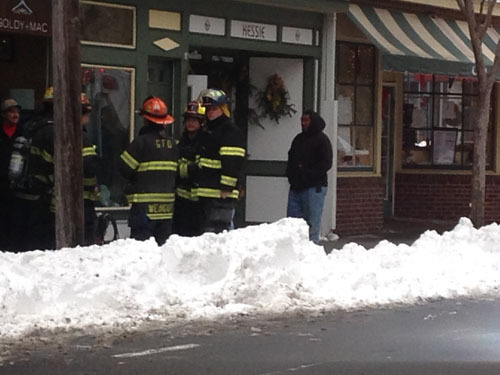 CYNDI MURRAY PHOTO | Greenport Fire Department volunteers were on scene for a gas leak early Sunday afternoon. A propane gas leak caused a scare in downtown Greenport early Sunday afternoon, shutting down Front Street temporarily while volunteers found a faulty valve in a downtown shop. Greenport Fire Department volunteers responded to Goldy & Mac on Front Street around noon. Front Street was closed between First and Main Streets during the investigation, though no injuries were reported in the incident. The shop was evacuated and remained closed on Sunday. The boutique, which also has three locations in Brooklyn, is typically closed on Mondays and Tuesdays this time of year and is expected to re-open on Wednesday. It was the second time in as many days that the fire department had been called to the location for a leak. Cyndi Murray contributed to this article. Note: The leak was apparently in a propane gas tank, since Greenport does not have natural gas access.